A closer look, with Macro Photography at the features of the famous classic ancient amulet Pra Wanta Sema 2463 BE, of Luang Phu To (Wat Pradoo Chimplee). This Pra Wanta Sema, is a truly rare and beautiful ancient amulet, of the pantheon of early era amulets of the great Luang Phu To, of Wat Pradoo Chimplee, the Pra Pim Wanta Sema Nuea Pong Wat Plab. Made from broken pieces of the original Ancient Wat Plab amulets (from which the original Wanta Sema design was taken). This edition was released in 2463 BE. 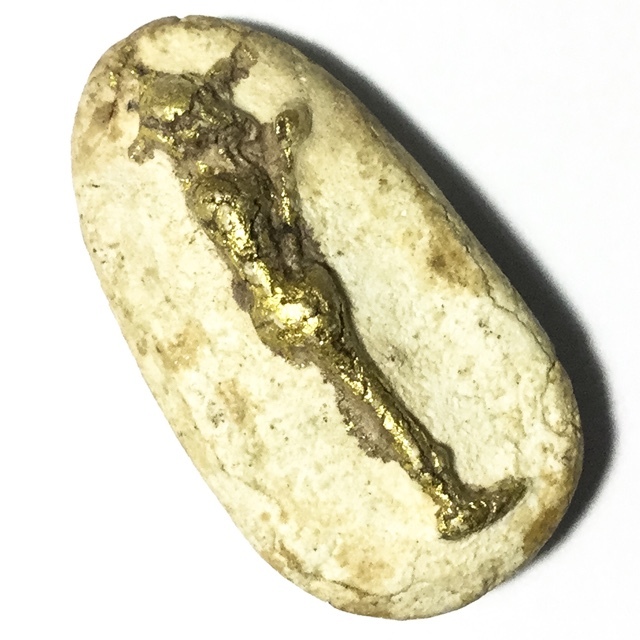 Classed within the classic pantheon of the first ever 13 Somdej Type amulets of Luang Phu To, which is one of his Great Pantheons of Millionaire Class Amulets of Ultimate Esteem and International Fame. The amulet is seen by some as the Sayasana Buddha (Reclining), and others pray to it as an image of King Rama 1 praying to the temple wall at the Royal palace, with Lotus flower in hands (part of ritual ordination), as he was ordained for the traditional practice of Thai Males to become a Buddhist Monk for a time. In those days, the Strategic Infantry Command Regiment were the main sponsors of the amulets created for Luang Phu To to bless, and this design was commissioned for Luang Phu To to press and bless, in the 2463 Edition. The amulet is reminiscent of the original Pra Wanta Sema Wat Plab by Somdej Pra Sangkarach (Suk). Pra Wanta Sema Wat Plab by Somdej Pra Sangkarach (Suk) has some discussion about the image and what or who it represents. The most common legends say, that it depicts a sleeping Buddha in the Saiyasana posture. But those who are more well studied believe the image to be a depiction of His Majesty the King Rama 1, holding the lotus of ordination, as a Monk and praying to the temple wall, before ordaining into the Sangha for the traditional period which Kings must ordain for. This is most likely the true meaning of the image. Wat Plab is one of the 10 official temples of the Dtamra Pra Somdej for its Muan Sarn Sacred Powders which belong within the Dtamra of Pra Somdej of Somdej Pra Puttajarn (Dto) Prohmrangsri Wat Rakang Kositaram. Macro Close up of the features and visual aspects of front face of Pra Wanta Sema 2463 BE Luang Phu To. A clear visual close up of the Muan Sarn Sacred Powders can serve the student well to examine and take note of the many different ingredients, and the appearance of the surface, its dryness, porosity, and the secrets of the interior content (where cracks reveal the inner substance). Above Pic; The aged surface is both hardened, dry and dense, and reveals the true characteristics of natural aging process over time, making it easy to authenticate. This type of clear-to-recognise features make the amulet a ‘Pra Tae Doo Ngaay’ (Easy to see as Real). 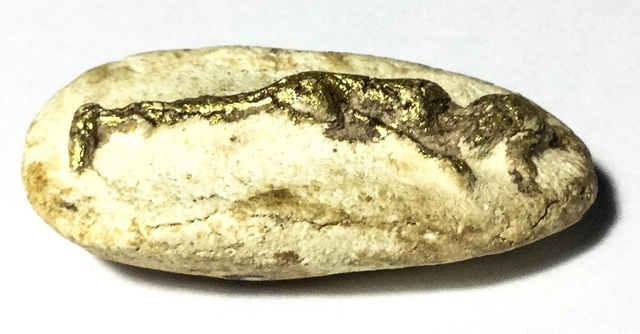 The surface of the amulet has a crinkled effect to it, where the Muan Sarn Sacred Powders have dried, and shrink inwards closing the gaps between the particles of powder, and tiny cracks have formed all over the surface as the amulet has shrunk from within over time, as it dries and hardens. The rear face is always the most important surface area for study once the front face features (Pim) have been confirmed to one’s satisfaction, and authenticated. Examination of the Muan Sarn Sacred Powders and surface features of the rear face, allows a much more accurate and detailed study of the content of the Muan Sarn, without obstruction of any design to obscure sight of the uniform raw surface features. The rear face surface shows a fine gossamer layer of mildew formation, which ranges in tonality from black, to brown, to light gray. This is also an important aspect of examining the ‘Kraap’ mildew on the surface of ancient amulets; Namely, that most authentic amulets will have a non-uniform surface tonality to the Kraap Kru Mildew, and that Fake amulets, tend to have a Uniform colour and tonality to the surface mildew. This is because it is almost impossible to spray a fake mildew onto an amulet, and make it have hundreds of different colours and tones to it, which is something that only happens with natural aging and atmospheric weather changes over many years of time. Fake mildew is more uniform, and the true authentic mildew is far more complex in its appearance. Please take note of this when examining amulets, and use the ‘Kraap Kru’ mildew as one of your authentication reference tools. Once one has examined front and rear face of an amulet, one should then continue on to peruse and examine the edges of the amulet, which will reveal its aging. One should peruse the cracks arisen through contraction, one is able to determine if the front and rear face surface appearance fits with what the edges reveal, as far as atmospheric changes, and under which conditions the amulet has been worn or kept over the years. For example, if the edges reveal that the amulet has contracted over a long time of constant dryness, but the surface of the front and rear reveal moisture exposure, then something would be amiss wouldn’t it? If the front face and rear face say the amulet has experienced multiple changes of moist to dry atmospheres, then the edges should also state the same. Of course, this is not an easy art to train the eye in, and you need to examine many amulets over many years to be able to see what the expert sees. Wat Plab has always been a temple that Luang Phu To was afilliated with and whose Muan Sarn Sacred Powders he always used in the making of his famously priceless amulets. The Muan Sarn Sacred Powders for the Pra Wanta Sema Luang Phu To, are indeed also composed of mainly broken pieces of original Wat Plab amulets, along with the other Sacred Ingredients which Luang Phu To would ubiquitously mix into the Muan Sarn, for all his amulets. Wat Plab amulets are a sacred powder type amulet using a mixture of ground sea shells, pollens and flowers, incense powders, temple wall bricks. The mixture used by Somdej Pra Sangkarach (Suk) was the basic formula of Pra Somdej made before any other ever, and is thus the keystone of Pra Somdej amulet making, and the origin of the Pra Somdej Wat Rakang. The Pim Wanta Sema 2463 Luang Phu To was released in the classic famous 13 Pra Somdej First Edition. The 13 Famous Pim, were made by Luang Phu To with the greatest passion and Highest Effort through Pure Intention, and had the intention to make them as Truly powerful as was possible. He spent a long time with much effort to find the rarest, most powerful and sacred herbs, woods and relic ingredients for the Muan Sarn used in the making of the Sacred Powders used for his Amulet. Most Pim were pressed by Luang Phu himself with his own hand, but he had help in assembling the Muan Sarn and many menial tasks from the Samaneras and the Lay Masters of Wat Plab temple. This is of course part of the reason that the Amulets of Luang Phu To possess Sacred Powders of Wat Plab in them too. The Great Masters of Wat Plab in Bangkok Yai revealed their secrets to Luang Phu, about the mixing of Muan Sarn. It is a hardly known inner secret, that, all of the Great Masters with great Wicha, passed through Wat Plab, to receive the Wicha and secrets of the Mastery of the Pra Piti Haa (5 Piti Jhana Control). They revealed to him the secrets of making ‘Pong Lob’ Sacred Powders, according to the Dtamra Pra Somdej of Ajarn Saeng, who is reputed to have taught the Dtamra of Pra Somdej making to Somdej Pra Puttajarn (Dto_ Prohmrangsri (Wat Rakang Kositaram). It is Pra Ajarn Saeng, who some groups believe is the True Discoverer of the Hin Sila stone with the Dtamra Somdej hidden within it. The debate on this issue may continue forever, for proof is unfound. One other major base ingredient of the Muan sarn used in this first edition of Luang Phu To’s Amulet Trajectory, was a type of ‘Pong Wised’ (Special powder) or ‘Pong Puttakun), which was colected over many years by Luang Phu To, as he wandered on Forest Tudong. Often he would travel together with Luang Por Sodh (Wat Pak Nam Pasi Jaroen), and another Famous Monk of that time whose name has been lost from all documentation. Luang Phu To of Wat Pradoo Chimplee was one of the greatest Masters of the Last Century, and a Highly revered Monk around the whole Kingdom of Thailand. he was Respected and revered by His Majesty Our great King, who was a close friend and companion. This Great Monk achieved his status through his Great deeds and his great Diligence in his Patipatā (Practice of Purity and Renunciation), and in his Great Attainments in Dhamma Pariyatti and Dhamma Patipatā. His Blessings are believed to possess the most powerful protective power, and to increase success and prosperity. 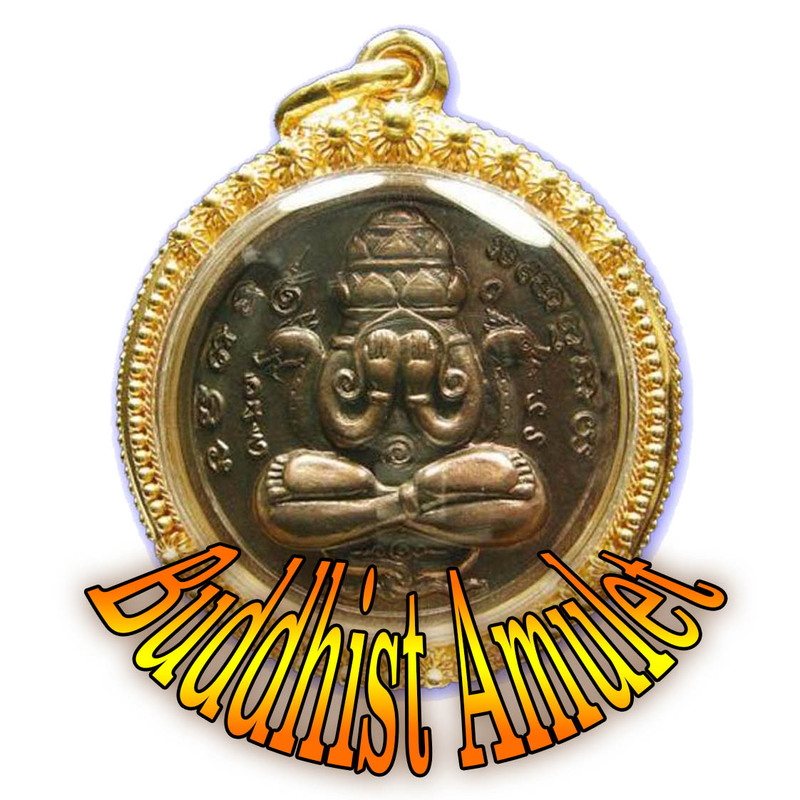 His amulets are both highly revered for their sacred Power of Protection and Prosperity, but also as a connection and Buddhanissati reminder of the Great Guru master, to beseech his blessings through the amulet.